conditions, H1 accompanies you along the way. H1 is ready to give you everything you need to know about where you are and where you're headed. With the built-in compass, H1 keeps you on the right track and guides you from campsite to destination, and back home again. You no longer have to pack and carry different instruments to help you on your way. The apps designed to help you navigate your adventures are what sets H1 apart from the competition. 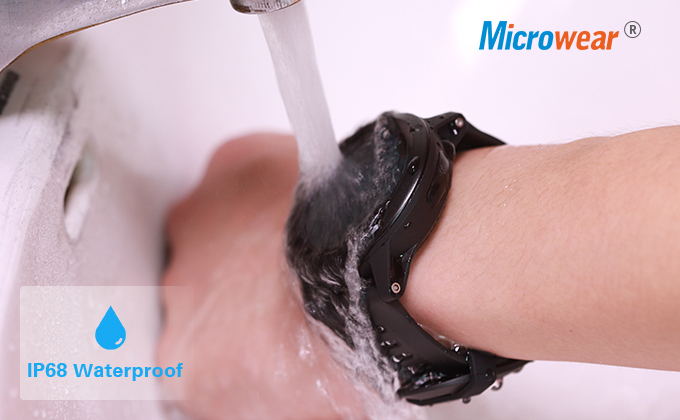 Altitude, air pressure and temperature are just a tap away. Know the conditions you'll be facing so you can be prepared for what nature throws your way! your exercise and H1 generates a graph of your overall heart rate data. You can get to know yourself even better. binge-watching Netflix with the sedentary alert. GSM compatibility allows you to make calls and text on H1. For most people, getting unplugged isn't an option. But with H1, you'll never miss the important calls or texts, even if you leave your phone at home! Get back that feeling of freedom and get out there! H1 offers up to 42 watch faces and still counting. sundry set of app icons. H1 lets you decide what you like and what suits the occasion. heart rate, steps tracking and more to be named. Unlocked for Worldwide use. Please ensure local area network is compatible. click here for Network Frequency of your country. Please check with your carrier/provider before purchasing this item. Product information （Download H1 User Manual Here ） Where to buy‍ ? 2. I want to use the sleep monitoring by my H1 but I don't know how does it work. Do I need to install any kind of application on the watch? 3. H1 could add the Blood pressure function? H1 does not have Blood pressure function but has Heart rate monitor. H1 only supports the Apple Google Music player, it does not support Bluetooth call, headset not support. 5. Could the Hear rate monitor keep testing all the time ? but if you use other functions , the heart rate testing will stop. 6. How can my phone connected to H1? If you still have any other questions ,please go to our official website and our workers will reply to you as soon as possible.